This past weekend my husband was super excited to harvest a few jalapeños form his plants. Yes, his plants. He said he wants the 4 jalapeño plants to be his little project so, I don't touch 'em. Plus, I can't handle any hot stuff so it works out. So he managed to harvest three jalapeños that were just right (or so he says). I asked him what we were going to do with them. Brian said he was going to save the seeds from one for next year and eat maybe one slice. Well, what do we do with the rest? I did a quick Google search to find an easy recipe that we had the ingredients for and came up with this one here. I definitely adapted the recipe to our taste and what we had in the kitchen but that's where I got my starting point. Disclaimer: This salsa is NOT spicy or chunky! I don't like spicy or chunky salsa. Fortunately for those of you who do, the method is only slightly different! Simply dice up your ingredients and stir them together rather than blend. And for spice, you can leave the jalapeño seeds or add in your favorite hot sauce! Easy peasy! Oh and this makes a lot of salsa! I got two full 16oz jars and two full 8oz jars. I used old salsa jars and jelly jars. I definitely want to double the recipe and then can it with my mom soon! Fresh salsa all year long would be fantastic! No tomato paste? No problem! Check out this version for an alternate way of preparing this! Cut up your produce. Remember to wear gloves and don't touch your face when you cut up the jalapeño! Remove the seeds if you don't like spicy salsa or keep them in if you're feeling brave! Toss all your ingredients into the blender. It's like a fiesta going on in there! Blend on puree but only for a few seconds. It doesn't need much. Inhale and try not to drool into the salsa. At this point do, break out the tortilla chips and do a taste test! Add more tomato chunks, hot sauce, another splash of lemon juice or whatever you want! That's exactly what Brian and I did. At first I tried to follow the original recipe just with extra tomato (in various forms) so it came out very tomato-y. So I added a little of this, a little of that and suddenly, it was just right! Since there is so much tomato in this salsa, it is very tomato-y but the best part is, you can customize this to your taste in no time! I put three of these right into the freezer so they would hopefully last us a little longer. The 4th one is now half empty. That's how good this stuff turned out! Oh and it looks so pretty too! I may need to just make this in large batches and not go back to store bought! Although, I do love me some Newman's Own Mild Salsa! The tomatoes we used were from a friend's garden so we were so excited to use them in a delicious recipe! I think it would amazing for all of the ingredients to be straight from the garden! Mmm! My plan for next year either at our house or my parent's house is to plant a Salsa Garden. It's one of those new things sweeping the internet. I think it would be really cool to do a themed garden like that, though. Or at least one section of the garden. Mine would have big tomatoes, jalapeños, onions, garlic, cilantro, and parsley planted in it. If that chip looks funny you're right. It's actually a failed tortilla. More on that later. What's your favorite brand of salsa? 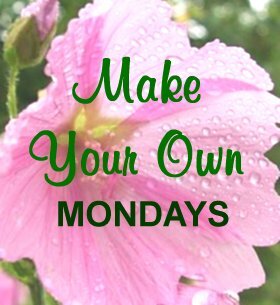 Do you make your own? What would you plant in your salsa garden? I linked up this post with Nourishing Treasures' Make Your Own Monday! 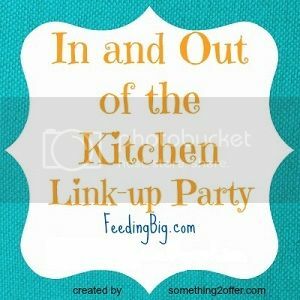 I've linked up this post with Feeding Big's In and Out of the Kitchen Link Party #29! 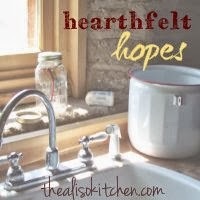 I've linked up to Hearthfelt Hopes #7 with The Aliso Kitchen! I've linked up to Less Laundry, More Linking #12 with Life After Laundry and Sensational Creations. I've linked up to the Pinworthy Projects Link Party 10/18/13 with Just Us Four, Planned In Pencil, and Atkinson Drive! Nothing beats homemade salsa! We love making pico de gallo at the house weekly! No kidding! We made another batch tonight because it's just so good! We're keeping half in the freezer though so we don't go through it too fast. Definitely going to become a common occurrence here too! This looks delicous! 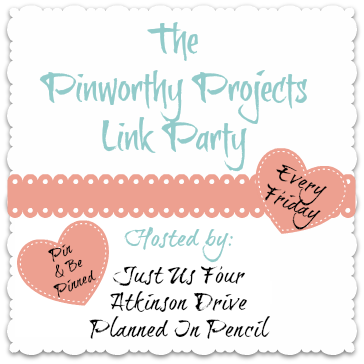 Thanks for linking it to Less Laundry, More Linking party! Thanks! It is so good...we can't get enough! This looks yummy! I'm saving it! Awesome! It's worth trying for sure! Thanks for participating. I always love to see what you come up with!